HOW TO PRODUCE YOUR OWN SPAGHETTI AND START SELLING . 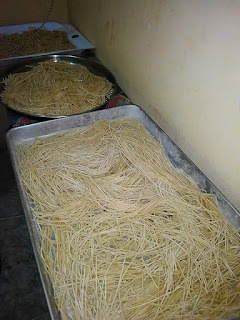 Spaghetti is a common food very popular among Nigerians and most people don't know that you can start making and selling spaghetti right from their home with a very little capital as low as 1,000 naira. Spaghetti is a very thin, long type of pasta that has its origin traced to Italy. It is mostly eaten with sauce or eaten as jollof spaghetti. Spaghetti contains 22g carbohydrates, 4g protein, 0.5g fat and 4mg minerals. Spaghetti is very easy to make ones you follow the procedures. 1.First of all you have to sieve your flour into a clean bowl . 3.Add a little water and mix well. 4.Pour in the eggs, mix very well. 5.Place the dough on a clean chopping board. 6.Knead the dough for 10 minutes or more. 7.Divide the dough into six and roll each of it, till, the tough is very light and flat. 8.Then wrap and slice, endeavor to sprinkle flour from time to time to stop them from sticking together. 9. After you are through, let it boil if you are cooking it immediately, but if want to preserve it, put in the oven to bake. Your home made pasta is ready. OLUWAKEMI BLOG : HOW TO MAKE AND START CUSTARD POWDER PRODUCTION.